Little Beaver’s Kwik-Trench mini-trencher is offered in two models, the KT200B and KT2400B, both capable of trenching up to 30 feet per minute. 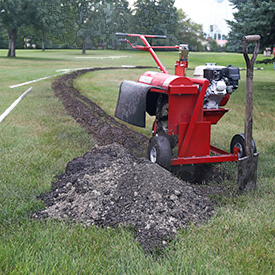 Its compact design and durable components allow the Kwik-Trench to efficiently tackle a range of projects from landscape edging and root pruning, to installation projects, including sprinkler systems, drainage linesand low-voltage wiring. The Kwik-Trench is capable of achieving depths up to 12 inches and features a powerful drive and carbide-tipped teeth for cutting through compacted clay, road fill, asphalt and tree roots.